Greetings Gent’s I decided I’m gonna pull the trigger on a Wolfman when right opportunity comes. Already research this topic a good amount of time but still have few unanswered questions. -Would you be so kind to shoot me some pictures if available of the polished version and the brushed version please. - does the polished version handle comes polished as well or is just the head ? -does the polished version requires more maintenance and is easier to scratch ? I only have the polished version. It is super easy to maintain and I've not the first scratch. Every surface is polished, even under the top cap. It has the best finish of any modern razor I've owned, which is a pile. (09-24-2018, 12:12 AM)LOOT Wrote: I only have the polished version. It is super easy to maintain and I've not the first scratch. Thank you for the input Gent’s looking forward for the right opportunity. Although I think I’m more inclined to brushed finish but will see. Can send some but truth told photograpghy not my strong suit. Will find James’ brushed finish not artificed as with others but subtle and deep. Itrespective doubt pictures, even well done, will fully capture the depth and subtlty of the brushed finish nor the swirl and distortion free polished finish. (09-24-2018, 03:06 AM)DanLaw Wrote: Can send some but truth told photograpghy not my strong suit. Will find James’ brushed finish not artificed as with others but subtle and deep. Itrespective doubt pictures, even well done, will fully capture the depth and subtlty of the brushed finish nor the seirl and distortion free polished finish. I believe that when you were talking about the wrh-2, the difference between the polished and brushed is only the head. I think the handle itself may be the same on both versions. The handle itself, at least the one I have, is sort of a mix of both polished and brushed. The curling is brushed in the rest of it is more polished. BTW, I really like my wrh-2. This is my WR-1, the base is polished and it doesn't seem to scratch at all. 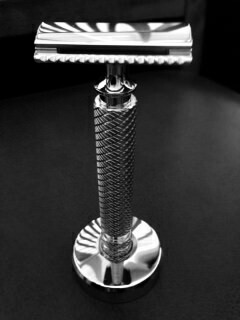 I can't compare it to a brushed finish because I don't have a brushed finish razor.